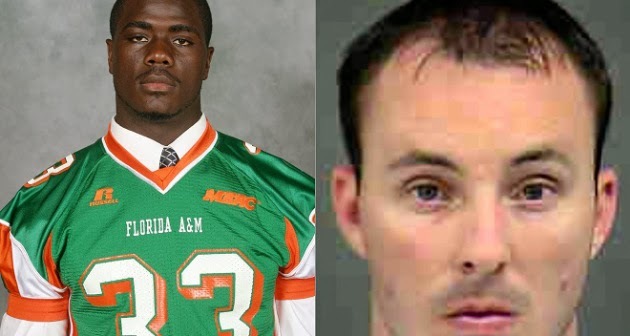 (CNN) -- A grand jury has indicted Officer Randall Kerrick of the Charlotte-Mecklenburg Police Department on a charge of voluntary manslaughter in the September 14 shooting death of Jonathan Ferrell, according to a statement from state Attorney General Roy Cooper. The grand jury heard evidence from the state Bureau of Investigation and the police department. "With the strength of the evidence in this case, we're not surprised," Charles Monnett, an attorney for Ferrell's family, said about Monday's indictment. "We're all pleased and happy that the process is beginning now and that there's an end in sight," he said. "It is the first step towards justice." Ferrell's mother, Georgia, told CNN that she is prepared to wait as long as it takes for the case to wind its way through the justice system. "I just feel like God's will will be done," she said. The Charlotte, North Carolina, officer faced a second grand jury proceeding for the fatal shooting of Ferrell, an ex-college football player who was reportedly seeking assistance after a car accident. Attorneys for Kerrick had denounced the prosecution's move to resubmit the case as unlawful and filed a motion to block it, but CNN affiliate News 14 Carolina reported the grand jury convened Monday morning. A grand jury last week declined to indict Kerrick. Prosecutors said afterward the grand jury was composed of less than a full panel and vowed to send the case back. According to a handwritten statement filed with the court, the first grand jury requested that the prosecutor submit a "bill of indictment to a lesser-included or related offense," but the state attorney general said he would resubmit the voluntary manslaughter charge. Chris Chestnut, another attorney for Ferrell's family, described relatives as "shocked and devastated" by the first grand jury's ruling and said they were concerned a "miscarriage of justice is imminent." Kerrick's attorneys, however, filed a motion Friday saying that any miscarriage was on the prosecution's part. North Carolina law states that a grand jury can be made up of 12 to 18 members, the defense attorneys said. Thus, the prosecution's claim that it could go back to the grand jury because fewer than 18 members initially heard Kerrick's case was spurious, the motion said. There was "nothing irregular or improper" about the grand jury that heard last week's case, the attorneys said in a statement. The motion further alleged that Cooper's statement to the media -- that "This is not over" -- and his announcement that he would resubmit the case was a "wholly improper and blatant attempt to influence the (second) grand jury." The defense reiterated its claim that the shooting, "while tragic, was justified under the circumstances presented to Officer Kerrick at the time," according to its statement. "We have seen news clips and interviews stating the community should be 'outraged' at the return of a No True Bill of Indictment," the statement continued. "Those outraged have simply not heard all of the facts and hasten to a position. The true outrage of this community should be at the Attorney General's complete disregard of the original findings of our first grand jury." Ferrell's family disagreed and issued a statement saying, "It appears that this motion was filed solely because Randall Kerrick's attorneys feel their client will be indicted once the full Grand Jury properly considers the evidence in this case when it convenes on Monday." Attorneys for Ferrell's family on January 13 filed a civil lawsuit connected to his death. It targets the city of Charlotte, Mecklenburg County, Charlotte-Mecklenburg Police Chief Rodney Monroe and Kerrick. Kerrick shot an unarmed Ferrell, a 24-year-old ex-Florida A&M football player, after a woman -- home alone with her 1-year-old child -- called 911 and reported someone was trying to break down her front door. It was 2:35 a.m., and according to the lawsuit, the woman "does not understand that Jonathon may be injured and is in need of assistance and becomes frightened by his presence on her doorstep at such a late hour. She quickly closes the door, calls 911 for assistance and activates her home security system." The woman told police Ferrell was "yelling for her to turn her alarm off" but never reported that Ferrell harmed her, made threatening statements, brandished a weapon or stole or vandalized her property, the lawsuit further alleges. Police were dispatched, and Ferrell walked down the street to seek assistance elsewhere, according to the lawsuit. Kerrick and two other officers arrived on the scene about 11 minutes after the 911 call, but Kerrick didn't speak with the woman, the lawsuit says. He instead tracked down Ferrell, who "never engages in any conduct which can be objectively reasonably interpreted as aggravated active aggression," according to the lawsuit. "Defendant Kerrick, in direct violation of written police department regulations, fires 12 high-velocity bullets at Jonathon, striking him 10 times in the chest and arms," the lawsuit continues. The Charlotte-Mecklenburg Police Department has called the shooting unlawful. "The evidence revealed that Mr. Ferrell did advance on Officer Kerrick and the investigation showed that the subsequent shooting of Mr. Ferrell was excessive," police said in a statement on September 14, the day of the shooting. "Our investigation has shown that Officer Kerrick did not have a lawful right to discharge his weapon during this encounter." Kerrick is free on $50,000 bond. His attorneys said in their statement Friday, "The citizens of Mecklenburg County by and through its grand jury have spoken. We pray that if this case is reheard by a second Grand Jury, the same conclusion will be reached -- that there is no probable cause to sustain an indictment for voluntary manslaughter against Officer Kerrick."